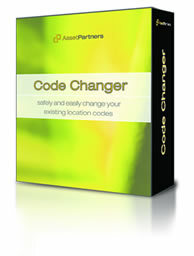 The Code Changer utility program (also known as Record Renamer) allows you to easily change your existing location codes, equipment or asset numbers, and other key values. 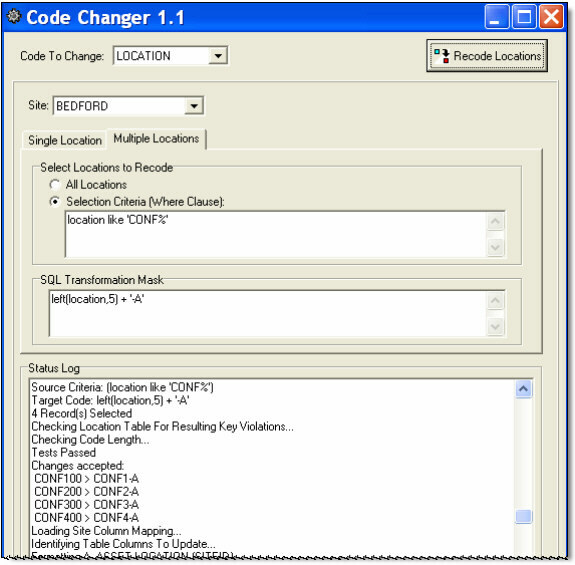 You can change codes individually or supply SQL-based criteria and transformation masks to mass update any number of records in one step. Example uses include adding or removing prefixes to key values, removing unwanted characters such as dashes or spaces, or changing any parts of intelligent codes to reflect organizational naming convention changes. This handy tool automatically determines all updates that need to be made for each change (typically more than 50 table/columns must be synchronized) based on your data dictionary to ensure that data integrity is maintained.